Wear your best Friday casuals and step into The Polo Club for an evening of indulgence. A new menu, an alfresco seating, and that ‘smack in the middle of The Oberoi’ location are what awaits you. The Polo Club, needs no introduction. The Oberoi’s bar comes with spacious seating, which offers a vibe that’s similar to gentlemen’s club but with a bit more relaxed and casual air. Outside the warm evening breeze, the pond, and the quiet ambience of the hotel is what you can enjoy. An evening chit chat, a casual dinner date, or a business meeting over a few drinks and nibbles are highly recommended at the club. The new menu at The Polo Club is all about interesting flavours that sit well with the casual evening you are in for. Nothing too over-the-top nor too bland, comfort food is the the right word to describe what’s served here. 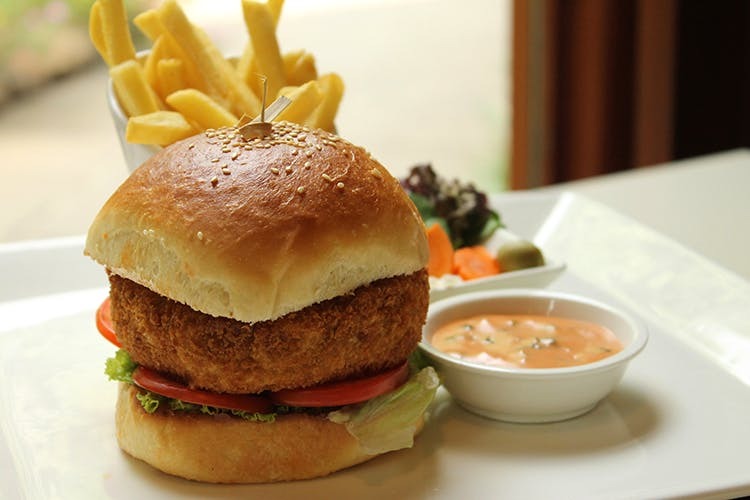 Starting with the fresh salads such as the Iceberg Wedges or Artisanal Buratta or mains such as the Chorizo Fritters or the Cordon Bleu Chicken Burger, the food complements the evening — warm breeze, casual chit chat, and the likes. A special mention to the burger is very much needed, for it’s perhaps one of the best we’ve had in ages. The anatomy included veggies, but it’s the cheese infused juicy chicken ham patty that killed it for us. Adding to the fray are the selection of signature seven signature cocktails that you can sip on all evening long. Our pick, Angels Share and Bijou, both of with feature barrel-aged alcohol mixes — the former comes with Grey Goose, Bombay Sapphire, and Martini Rosso while the latter is minus the Goose but with the addition of Cointreau. End the night on a sugar-high with desserts such as Churros with Chocolate Sauce, Hickory Smoked Bitter Chocolate Cake, and Berries and Vanilla Gelato. The evening comes with a price that’s not really pocket-friendly, but then again, you are going all out with the whole indulgence thing, so it’s cool.